You can build your dream bath place with smart planning and the right bath accessories and bath products. We at hometown understand your needs and provide a plethora of bathroom accessories online including shower rooms , bath tubs , bath vanities , shower multifunctions , shower panels & bath linen items which are required on a daily basis for your beautiful home. We even have a wide range of laundry products which ease up the process and help you perform daily task with much ease and comfort. With endless bath accessories products available online at HomeTown, choosing the right bath product is a critical strategic decision. It’s also critical to strike the right balance between technology and design. To carve out a niche for you, going through the bath product descriptions is of paramount importance. Hence the decision to buy bath accessories is more or less dependent on your overall information about the item you want to buy. Multifunction Shower Room – These days a large number of the gentry are replacing their bathtubs with shower rooms. Our closed shower cabinets have their own roof closed by a wall from all sides. At HomeTown, we have simple shower rooms as well as a multifunction shower room. Depending on your requirement, you can choose our shower rooms in round, semi-round, square, rectangular and corner shape. The multifunction shower rooms are suitable for everyday use. They come with outlet nozzles located on the sides and bottom of the bath in a specific order. Massage is done itself through the layer of water. Nozzles are attached for creating jets of air bubbles and water flowing in various directions with regulated pressure. Glass Shower Cabin – We bring you ancient wisdom in a modern package with a host of Glass Shower cabins that have limited space. The shower rooms are designated to have a shower and other hygienic procedures. You can find open and closed glass shower rooms made of transparent glass. This broaden bathroom space adds weightlessness and elegance to the design of even the small bathroom. 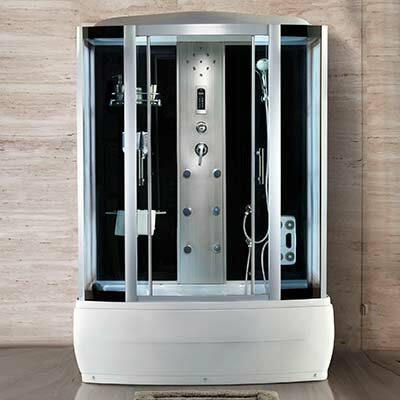 Our range of multifunction shower rooms includes Valentino Acrylic and Glass Shower Enclosure Apollo White, Discovery Acrylic and Glass Shower, Prestige Acrylic and Glass Multifunction Shower room, Elite Acrylic and Glass Shower Enclosure, Ambra Acrylic and Glass Multifunction Shower Room and much more. Variety of Vanity – HomeTown offers you a range of wall-hung bath vanity of different brands that have the potential to create more usable space for stashing pieces like a wastebasket or a scale. Our range of bath vanities includes Convex PVC Ceramic Vanity, Blossom PVC Ceramic Vanity, Kaiser Vanity, Poise PVC Corner Vanity, Marvel PVC Vanity, Iris PVC Vanity, Glam PVC Vanity, Carron PVC Vanity, Fab PVC Vanity, Magnum PVC Vanity, Titan PVC Vanity, Cosmos PVC Vanity, and many others. Our range of beautiful and stylish bath vanities make your bathroom look more prominent, accommodate every height, make cleaning process easier, put your tilework on display. Most importantly, they are ideal for every family member. Shower Panels – Your bathroom with a stylish and modern shower panel is incomplete. That’s why, HomeTown brings you different types of shower panels such as Spark Shower Panel, Snow Shower Panel, Skift Shower Panel, Angel Shower Panel, Ocean Shower Panel, Spade Shower Panel, Amazon Shower Panel, Grace Shower Panel, Char multifunction panel, Bliss multifunction panel, Apollo panel, and Shower Panels of many other brands. Buy bathroom accessories online at best prices on HomeTown and get doorsteps delivery across major cities in India. HomeTown offers a wide range of bathroom accessories sets for all your home needs at low prices in India. Explore a wide range of quality bath accessories and bath products and purchase the one which fits your requirements today! If you are tired of finding the right bath accessories in the market, it’s time to find them at HomeTown. Just log on to hometown.in , India’s largest online home store and bring home the best bath products. Browse all you need for your home from the vast range of bath products. It is simple and easy to shop, as you need to choose the bath products and order online. You have the option to buy through cash, credit card, debit card, net banking, or EMI. Shopping is no more a tedious task with us.